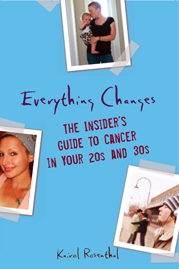 Everything Changes – The Guide to Young Adult Cancer » How Has Your Employer Handled Your Illness? I work in drug safety testing, for a group that makes — cancer drugs (among others.) So not only did I know what I was up against when I was dx’d with stage IV rectal cancer mets’d to my liver — so did everyone I worked with. Individually, my co-workers have been very supportive. It’s kind of hard to be ‘formal’ about discussion of my cancer, since I wasn’t the one disseminating huge chunks of the information. I would explain to someone in my group, and then a mass email would go out with an update. Yeah, there are some people for whom that was too much information, but for the most part it worked out ok.
My supervisors and management all the way up to vice-presidents have known all the details from the beginning, and at first were very supportive. As I continue surviving, however, things have changed subtly. I was taken off the promotion list when diagnosed (so now I’m two job grades ‘behind’ others who do the same job I do.) I was given less active roles in important projects where, if healthy, I’d have been in a lead role. There’s been a lot of pressure on me to have a succession plan and backups in place at all times — something co-workers don’t have to deal with. In some ways, I’ve kind of cross-trained and backup’d myself out of my own position! I’m very proud of the strong team I’ve been able to create — and very insecure about my own place in it. Now I’m facing the choice of layoff or relocation within 15 months. Because I was taken out of promotion rotation, I’m at a lower job grade than I should be — which means I’m eligible for less relocation assistance and can only bid on a narrow spectrum of jobs. The supervisors who were around when I was dx’d over five years ago are mostly retired now. My direct supervisor is very accepting (but she’s leaving soon.) Newer management seems less tolerant of the kinds of accommodations I need to function (more flexible hours, ability to work remotely from home, etc.) I’ve said out loud that I don’t necessarily see a place for me in the organization going forward, and that’s the truth. But I’m also 15 months away from 55, the birthday milestone I need to hit to preserve the retirement plan investment I’ve been making for 24 years. Three years ago, I think there were managers and HR people who would have bent over backwards to help me hit that target date. Today, I can’t say for sure that will happen. My workplace is extremely competitive, and I knew that “she is sick and can’t perform” would be a deadly perception for keeping my job. I am single, and support myself and will have to support my aging parents if/when needed. I need my job to keep my health insurance. So having to tell my boss that I couldn’t perform my duties, which consisted of frequent international travels to countries with very limited access to doctors/facilities, was extremely stressful. I knew that I had the right as an employee to expect the management to give me assignments that accommodated my needs, but I wasn’t as naive as to think they will be happy or be accommodating forever. So, before I went to talk to my boss, I went to talk with an independent counselor at work, to learn more about how I should present my case, how much I have to disclose, and what I should expect from the management. It helped a lot in knowing that I don’t necessary have to beg for mercy to keep me there. It wasn’t a big surprise that my boss said “don’t worry anything about work. Just concentrate on getting better”. I had been known as a good worker and he is a very good person. I basically got fully paid for doing nothing the last two years. Of course, though, I had to forget about the promotion that was discussed pre-diagnosis. I couldn’t perform the duties that were necessary to be promoted. But that was ok for me. I would not have been able to perform at that level anyway. There was one co-worker who did try to use my illness as a reason to give me bad feedback on my performance evaluation, but my boss shot him down. Other colleagues, whom I told about my illness, had been more than supportive and I know I am extremely lucky. But just like the above poster, I do sense that they will not accommodate my needs forever. Somehow, I feel that they expect that we either die or get better to be back to “normal”. This is simply not the case for a lot of us. It’s almost like “you are better and look fine so you should be able to do all those things you used to do before” – well,I am better precisely because I am not doing the crazy traveling and overtime, besides my medicine working to stablize my condition. I am looking for a new job that doesn’t put me at a disadvantage due to my inability to travel. But, then I am facing this question whether or not to tell the prospective boss about my condition. Having a chronic illness and keeping a job is not just a physically demanding challenge but also a really very tricky maze to navigate- full of landmines. I would love to hear from others about how they deal with protecting themselves. I’ve been lucky that my employer has been so tolerant/supportive so far. what was supposed to be 6mo state disability, then turned into 6mo more of our organization’s disability. and now I’m still not better and am currently waiting to see if the disability will be extended. I havent been dropped from insurance yet, but know that I can be at anytime. We’re a small nonprofit, so I know my illness must affecting them financially. My boss has emailed me the whole time concerned with how I’m doing. I struggled with how often to reply and how much to say, but I found based on my boss’s personality, keeping some sort of relationship there seems better, like they’re more emotionally invested in me. not that that guarantees any protection whatsoever, but in my particular situation, it seems it might help. I’ve been treated the same so far before/after illness, but not sure how much longer she can be so nice. I cant blame her if she has to cut me off, cause i dont know how many employers would’ve been this patient so far. Like the above poster mentioned, I think it’s extremely tricky to deal with and try and protect yourself. Since I have a more friendly relationship w/my boss, I struggled with how much info to give, but still “be safe”. I’ve loosened up a bit, probably more than I should, but I’m just exhausted. It’s a tricky situation, I dont want to seem like I’m lying, pretending i’m going to be fine and ready to work, when i’m nowhere near that. But I dont’ want to make things sound hopeless like I’m not going to be back either. So I’ve gone with giving some specific info of how I’m doing and next steps. So it feels like there may be some hope, something I’m trying, to move the process along quicker. I also recently contact the Patient Advocate Foundation and will see if they have any other info for me as I move along. Especially since now i feel I’m getting close to “running out of time” and not sure how I’ll support myself if i lose disability & insurance. What tricky circumstances you have ALL had to navigate. Tara, you raise a really interesting point about communication, and while I believe you don’t need to overload a boss with too much of the details, it is so important to stay in communication with them, let them know how you are doing, even if you are not ready and raring to go back to work. Continued communication builds confidence with bosses, co-workers, and clients. Keeping them in the loop is a good thing. How much in the loop is such a tricky one to define! PAF is a great resource. Glad you are connecting with them. If they cannot answer all of your questions, also try the Cancer Legal Resource Center. C&C has some great guides and checklists for working women survivors. I had very tough time with work after my brain tumor diagnosis. HR told me I better be ready to work a 12 hour day when I returned to work–never a requirement before my DX. My doctor wrote a return to work letter, including some temporary accommodations, typical for my diagnosis. My HR went straight to doctor and told him to rewrite everything with no temporary accommodations. Cancer makes you bolder and more perspicacious too, I think — to take more risks on things you always wanted to do but postponed due to the tyranny of fear. But really, why not try something you have always wanted to do? Some people who are perfectly healthy may be missing out on the that pearl of wisdom. I was a cadet a few months shy of receiving my commission as an US Army Officer when I was diagnosed. The Army declined my contract and discharged me because I had the audacity to get cancer. I was informed that I could reapply for service only after I could demonstrate a period of five years without any treatment for cancer and I guess if I wasn’t dead. Then if an Army medical board deemed that the unwholesome fact that I had had cancer wasn’t too much of an inconvenience for the Army then I might be able to serve the nation. I did not. I have tmjd which basically means I have migraine like headaches 24/7. I am undermedicated tired and fatigued. For the past five months or so Ive been displaying stunning intermident neuro symptoms that basically leave me confused with an inabilty to get things accurate. Basically as a receptionist I make a few typos my job is not that complicated and they can all be fixed in secs if I can see them. My boss had no issues with my work standards at all until it became obvious that I was going to need extra assistance, or, grace and forgiveness on their part that their attitude changed. Suddenly my work is now ‘highly unsatisfactory’ and I must get everything 100% right all the time or I will be sacked immediately. My colleagues were commissioned to monitor and log errors which some have done with relish. (Theres nothing like picking on the receptionist to make you feel like a man) This being civilised Australia and there being anti discrimination laws and new fairer work place laws I called the union and asked what to do. It turns out that if they speak to me and I cant do it im screwed and there is nothing anyone can do. They are firing me now any week. It is the second job Ive lost. Its difficult not to be discouraged as I have to start again at a new job in a quiet job market. I find myself unable to kick up a proper stink as their is a vital piece of paper I need them to complete so I qualify for unemolyment benefits.Its a legal requirement that they complete one but my boss likes to drag his feet on vital paperwork and Im worried he will just ‘forget’ to complete one until he ‘gets around to it’ many weeks later leaving me without any income at all. I have been working with the same employer for almost 5 years and pretty much everyday, I am ready to quit. I had to have 2 surgeries this year and my boss decided to disclose my medical information in an email to everyone without my permission. She also wanted to know what doctors I was going to a couple of months ago and I informed her that was private information. She said “According to you, it is private.” I was blown back. I went to HR about it and they said they would educate her about it. It feels like I got blown off. I submit my doctors’ notes to HR now and only inform my boss that I have dr appointments, but all of the little stuff there has added up. When I was going through chemo and needed help with this filing, one lady asked me if I needed help with anything and I said yes with the filing. She said “No, it makes my hands dry.” Another time she said “No, I am on my period.” Seriously?! I had just had a Nulasta shot and had no hair. I was also tired and she said that to me. My dr also placed me on permanent lifting restrictions back in May, but nobody really helps me out. I have mentioned I get hot flashes and worn out from doing the filing. Let me explain, I have to pull open the heavy duty fire safe drawers to cabinets that hold vehicle titles and put those away. I get in around 700 titles per month for vehicles. This is only a small part of what I do and I can only get assistance if someone is assigned to me or someone volunteers. If someone volunteers, as I said earlier, I get no. If I ask my boss for assistance, I get no. There are other things that have happened, but this is just part of it. I hope to get into something else within another year tops.